Miss England Rachel Christie has given up her crown after being arrested on suspicion of a nightclub assault. Organisers of Miss England said the 21-year-old wanted to concentrate on clearing her name. She allegedly punched Miss Manchester, Sara Beverley Jones, 24, in the face in a dispute at a Manchester nightclub. Ms Christie, the first black woman to be crowned Miss England, was arrested on suspicion of assault and has been bailed until January 2010. 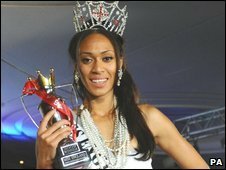 The beauty queen, niece of former sprinter Linford Christie, is also a heptathlete hoping to compete in the 2012 Olympics. Miss Manchester was allegedly punched in the face after an argument said to be about a TV personality from Sky1's Gladiators programme. It is thought that Miss Jones is an ex-girlfriend of TV gladiator Tornado, whose real name is David McIntosh, and Miss Christie is his current partner. In a statement, Miss England organisers said: "Due to the media attention following the allegations against her, Rachel Christie has now decided to withdraw from the Miss World competition and relinquish her Miss England crown. "Rachel will concentrate on clearing her name and focus on training for the 2012 Olympics until this case is resolved." Greater Manchester Police confirmed that they were called to the Mansion nightclub off Deansgate shortly before 0100GMT on Monday.